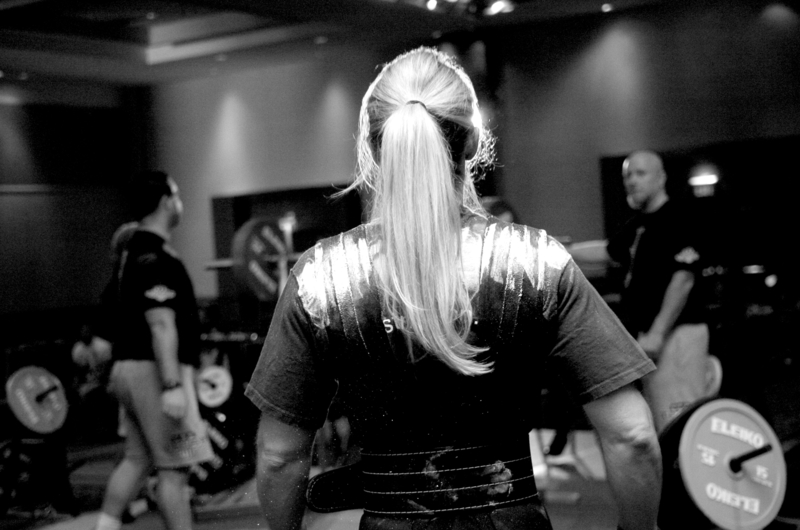 I have met some amazing female powerlifters in my last two decades in the sport. I am not just referring to phenomenal women lifters such as Jennifer Thompson or Sioux-z Hartwig Gary, I am talking about amazing people. It takes a special kind of person, with a special kind of strength, to break the mold, cast aside old stereotypes, and create some new. Powerlifting is not and should not be a male-only domain because self-improvement is not a male-only domain. There are few things better than feeling confident about oneself. Feeling that you can handle whatever challenges life can throw at you. I always remember the comment Arnold made after he was in a particularly tough business meeting. His friend noted “man, that was a really stressful meeting,” to which Arnold responded “you should come train legs with me if you want to know what real stress is.” I may be paraphrasing the story but you get the point. Facing a challenge, overcoming it, and emerging stronger (both mentally and physically) is a very rewarding process. It is great to see women lifters in powerlifting smashing PR’s, setting new records, and equally importantly showing other women that lifting heavy weights won’t make you look like a man. True strength is forged in the fires of adversity. True strength is exposed when one develops an unshakable belief in one’s self. One of my missions in writing the powerlifting book, posting articles, and coaching my powerlifting team is to help bring like-minded people together. To that end I wanted to put together a post that highlights various sites that support and promotes serious women lifters. To further clarify, there are lot of sites that cater to powerlifters as a whole – both men and women. But in this article I want to focus on sites that are specifically for women lifters by women lifters. This site is run by Ivy Knight and it has a blog and a store. The blog features articles such as meet recaps, Love Yourself through Lifting and Life, and How to use a Belt, just to name a few. The site is well done and features a lot of good info. This site empowers women to be their strongest self. It has articles, offers coaching and handbooks, and lots of info about strength training. It is made up of an advisory board of 10 popular women in the fitness world. This site is run by Meg Squats, a powerlifter and trainer that has a very popular youtube channel which can be found here: https://www.youtube.com/c/megsquats The goal of this site is to connect “strong friends” and bring them together. This is the youtube channel of Jennifer Thompson. Jen is pound for the pound the best female bench presser in the world, recently having benched 313 lbs at a bodyweight of 132 lbs drugfree. Jen is one of the female lifters I interview in my book All About Powerlifting and she has been a mainstay in the sport for over a decade. She is extremely nice, genuine, and always willing to share her knowledge with her fans. Ironsisters is a site run by Frances Manias. They put together a strength camp both in England and the US which is run by the highest level female lifters. Frances shares her journey of transformation as she discovered weights. Coaching is available through this site as well. This is a facebook page designed to promote and spotlight women powerlifters. They feature women of all walks of life and cater to both raw and equipped lifters. Belle of the Bar is run by a group of 4 women; 1 crossfitter, 1 powerlifter, and 2 strongwomen. They post articles and videos and offer coaching if desired. Nia Shanks, a no-nonsense trainer and coach, wants women to know how to train the right way. She set up Lift Like a Girl and regularly posts high quality blogs and articles on her page. She is available for online coaching as well. To all of the lady lifters out there – keep doing your thing. Lead by example and be the change you want to see in the world. We are all Brothers and Sisters of Iron and we are all working toward the same goal. If I forgot any great sites that promote women’s powerlifting I apologize. Help me out and make up for the deficiency by posting your favorites in the comments below. We have a great little Facebook group specifically for women in strength sports in Minnesota – it’s called Ladies Who Lift – Minnesota. We welcome anyone at any stage, and have bi-monthly “meet ups” at gyms throughout the state to give each other tips, have spotters and hand offs, lift with other women (because some of us never get to), and generally be goofy – and we always eat afterwards! We love new members!